Stay Smart With Us in Whitby, Ontario Welcome to the fantastic Holiday Inn Express Whitby/Oshawa located in the heart of Durham Region. Named by MoneySense Magazine as one of Canada's 100 best places to live in 2015, we are excited to bring great accommodations to our guests while they are visiting the Whitby/Oshawa area. We pride ourselves on having a great location whether you are travelling to a local business, participating in a local sports tournament, attending a wedding or just visiting the area; we know how to meet your needs. Conveniently located off of the HWY 401, we are within walking distance from Restaurants and Entertainment such as Kelsey's, The Social, The Tap and Tankard and The Greek Tycoon (to name a few). We are also within walking distance from the Whitby GO Station and an hour train ride from downtown Toronto. Before heading out to explore the area, come and enjoy our signature Hot Continental Breakfast. We also provide complimentary parking, a fitness room (renovated end of 2014), and high-speed, Wi-Fi Internet access throughout the hotel. Come for a dip in our outdoor heated saltwater pool (open seasonally), or just lounge poolside it and catch some rays. 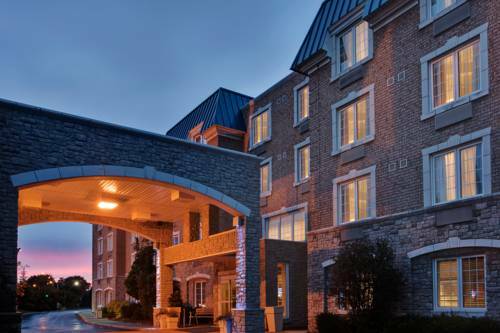 Come explore Durham Region and stay in the best hotel in town - The Holiday Inn Express Whitby/Oshawa. We hope to have the opportunity to accommodate you soon! Kelseys Restuarant: Walk across the street and enjoy a variety of delicious entrees. They are always excited to see you and can also accommodate large groups. Swiss Chalet: If you enjoy delicious chicken then definitely check out Swiss Chalet. It has a great family atmosphere with very affordable pricing to meet any budget. It is right across the street from our location so it makes it a great choice. Milestones Bar & Grill: If you are looking for great atmosphere, wonderful presentation and delicious foods this is the place for you. Just down the street and tucked at the back of the Landmark Theatre Plaza. Montana's: Head over to Montanas for some great tex mex food and wonderful atmosphere. This is also a very kid friendly restaurant. Childrens's program - Whitby/Oshawa offers lots of activities from rockclimbing, bowling, ziplining, tours, Toronto Zoo/Bowmanville Zoo, waterfront trails and more. The hotel has a seasonal pool to keep children entertained for hours. The Oshawa CentreVisit the Oshawa Center located 10 minutes from the Holiday Inn Express Whitby. This mall offers over 200 stores for your shopping pleasure! Whitby GO Train StationGO Trains & GO Buses serve a popul.of seven million in an 11,000-square-kilometre area, stretching from Hamilton and Waterloo in the west to Newscastle & Peterborough in the East and Orangeville and Barrie in the north to Niagara Falls in the south. Deer Creek Golf CourseThe North and South courses feature some of the most challenging, enjoyable and pristine holes in the Durham region. Renowned for 2 of the Best 18 Holes in the GTA and offering the best value golfing experience in the area. University of Ontario Institute of TechnologyThe University of Ontarion Institute of Technology is not only a wonderful place for students to learn and grow but also offers tons of events, tradeshows and activities. Iroquois Park Sports CentreThe Iroquois Park Sports Centre (IPSC) is Canada s largest municipal sports and recreation complex. And, by virtue of its size and available facilities, IPSC is a choice destination for large scale tournaments, athletic events, shows and special events.